As of 1st April 2017, a well-known Indonesia’s premiere hospitality company, InterContinental MidPlaza Jakarta, is now rebranded as AYANA Midplaza JAKARTA. The rebranding becomes the significant milestone in the company plans to launch AYANA hotels across Indonesia, said Clive Edwards, General Manager of AYANA Resort and Spa BALI. Clive adds that the company is excited to present the best for Jakarta’s urban travelers who love the glamorous and luxurious lifestyle. With 366 room and suite, AYANA Midplaza Jakarta will be a top urban destination for stylish accommodation, memorable dining, and modern spa experiences. 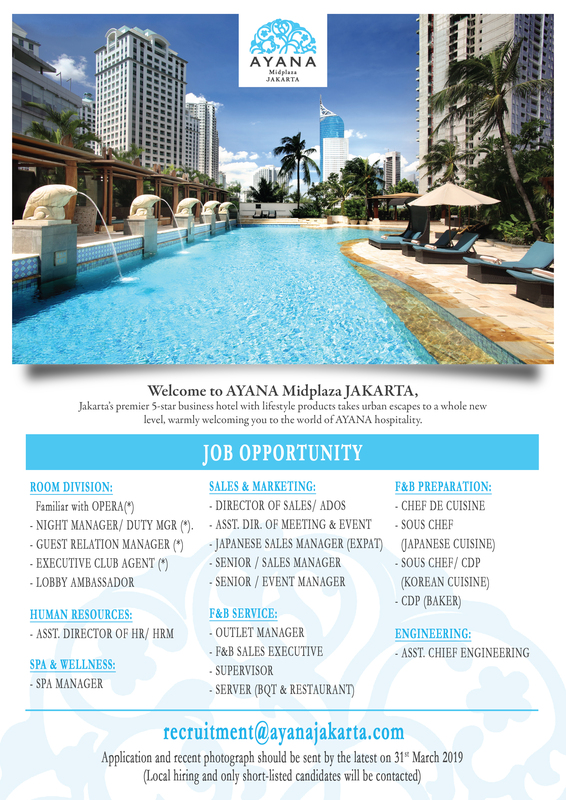 AYANA Midplaza JAKARTA is located in the popular business, shopping, and dining area of Jalan Sudirman. It takes merely 45 minutes driving from Soekarno-Hatta International Airport and about 2 kilometers from Plaza Indonesia. With 8 authentic signature restaurants, relaxing modern spa, contemporary collection of rooms and suites, and impeccable guest service, AYANA Midplaza JAKARTA proudly presents the Indonesia’s iconic hospitality to provide every guest with a memorable and fulfilling experience. The 5-star hotel appoints Philip Ommen as General Manager of the management team. With this important role, Philip will run all aspects on day-to-day operations to guarantee the highest quality standards and preeminent service for guests. Along with the rebranding, Philip’s most fascinating work is remodeling AYANA Midplaza JAKARTA’s main lobby. The project that is scheduled for completion in May 2017 will represent the new era of Jakarta’s lifestyle hospitality. The main lobby is an artwork piece that reflects the city’s vibrant mood. Recently, Philip served as the General Manager at Radisson Bali Tanjung Benoa Bali and Thistle Port Dickson Resort in Malaysia, yet to include Philip’s prior experience as the Vice President of NagaWolrd Hotel & Entertainment Complex in Phnom Penh, Cambodia. With over 28 years of experience in the hospitality, Philip and his team will alter AYANA Midplaza JAKARTA into the most wanted destination for the true wellness escapes.